The tumultuous U.S.-Cuba relationship has its roots during the Cold War. In 1959, Fidel Castro and a group of revolutionaries seized power in Havana, overthrowing President Fulgencio Batista. The United States recognized Castro’s government, despite misgivings about his communist political ideology. However, by 1960, tension between Cuba and the United States grew when Cuba increased trade with the Soviet Union and increased taxes on American imports. The United States retaliated by slashing Cuban sugar imports, and then imposing a ban on nearly all exports to Cuba. President Kennedy then issued a full economic embargo that included travel restrictions. By 1961, the United States had severed all diplomatic ties with Cuba and attempted to overthrow the Castro regime through covert operations. The Bay of Pigs invasion has been widely regarded as a botched CIA back attempt to overthrow the government that led Cuba to allow the Soviet Union to build a missile base on their island. This led to a twelve-day nuclear standoff between Cuba and the United States Eventually, the Cuban Missile crisis ended with an agreement that the missile base would be dismantled and that the US would not invade Cuba additionally the US would remove its nuclear missiles from Turkey. Since then, the US and Cuba’s relation have been hostile at best. The US and Cuba held on to this Cold War grudge until December 17, 2014, when Presidents Barack Obama and Raul Castro announced a historical break in the relations between Cuba and the United States – the U.S. and Cuba would restore diplomatic ties. The attempt at normalizing diplomatic relations was facilitated, surprisingly, by Pope Francis and Minister Stephen Harper of Canada. The change began with a prisoner swap and Havana’s release of a jailed U.S. contractor. 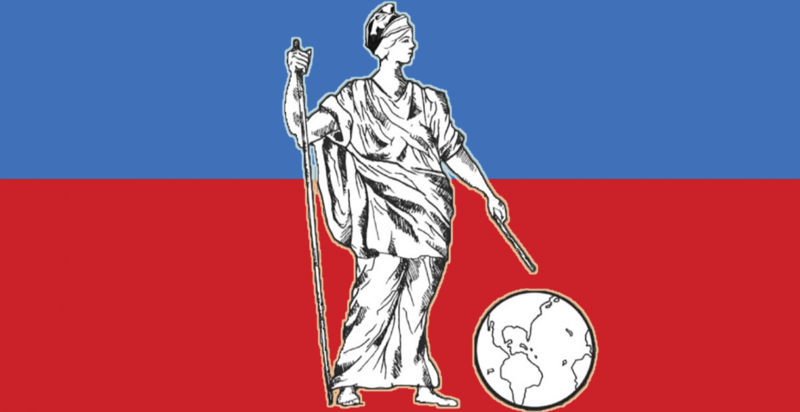 Furthermore, the United States eased restrictions on remittances, travel and banking. In return Cuba released 53 political prisoners. However, the U.S. trade embargo, which requires congressional approval to be rescinded, is unlikely to be lifted any time soon, due to opposition in Congress. Both governments are learning that fifty years of isolations has not worked and there has been no improvement between the two nations. This change is a long time coming. This historic step will open a new era of relations between the two nations. It will help ease the tension, and the United States can help create stability to handle the economic, political, and social transformation that Cuba desperately needs. For this reform to be effective each nation needs to adjust their hostile attitude towards the other. Cuba needs to readjust its socio-political institutionalism. According to Human Rights Watch, Cuba continues to repress individuals and groups who criticize the government. By no longer isolating Cuba, the human rights situation in Cuba will hopefully improve and eventually lead to political reforms. Both countries are optimistic about progress occurring. Although, it will take time so see the long-term impact, there are some immediate impacts occurring right now. The immediate change was reestablishing diplomatic relations that was severed in 1961. The U.S. is even attempting to reestablish an embassy in Havana. Additionally, the U.S. is expanding travel to Cuba. There are some groups that fear that this not a positive step. The U.S. delegation voiced concern over the lack of freedom of expression and assembly in Cuba and the Cuban delegation responded stating that the U.S have issues regarding police brutality and inequality, and the issues surrounding the torture and indefinite detention of Guantanamo inmates. Moreover, President Obama is under pressure from Republicans to make a breakthrough with Cuba on human rights. 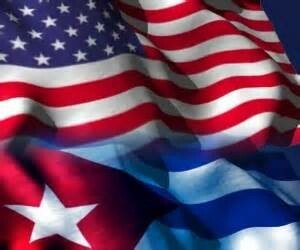 The Cuban government has acknowledged that they have work to do regarding human rights. We know that the road to progress won’t be easy and it will be marked by personal limits, political errors and human fears. Many obstacles lay ahead for both countries to overcome, especially with the historical problems between them. There is profuse distrust on both sides, yet it is a change that finally needs to start happening. So grab your passports and head to Cuba while you can! Danielle Renwick & Brianna Lee, US-Cuba Relations, Council on Foreign Relations (Jan. 20, 2015), http://www.cfr.org/cuba/us-cuba-relations/p11113. Claire Suddath, A Brief History Of U.S.-Cuba Relations, Time (Apr. 15, 2009), http://content.time.com/time/nation/article/0,8599,1891359,00.html. 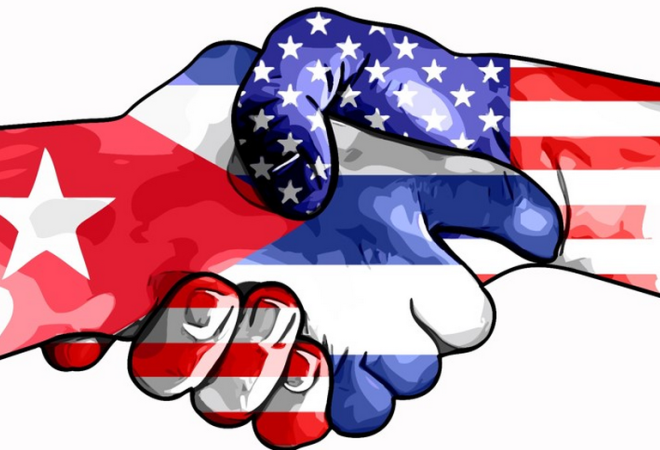 Immanuel Wallerstein, Cuba and the United States Resume Relations: Happy New Year!, Common Dreams (Jan. 2, 2015), http://www.commondreams.org/views/2015/01/02/cuba-and-united-states-resume-relations-happy-new-year. Lenier González Mederos, Cuba and the United States: The Challenges of Starting Anew, Huffington Post (Jan. 29, 2015), http://www.huffingtonpost.com/lenier-gonzalez-mederos/cuba-and-the-united-state_1_b_6571814.html. 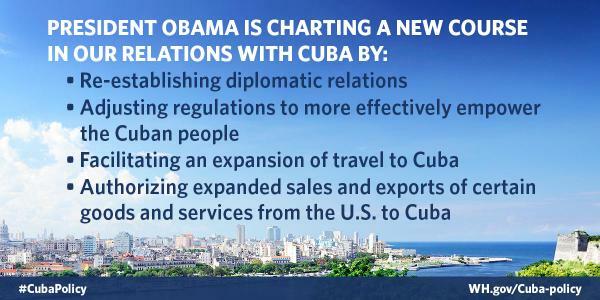 Charting a New Course With Cuba, WhiteHouse (Dec. 17, 2014), https://www.whitehouse.gov/issues/foreign-policy/cuba. Categories: Uncategorized | Tags: Castro, Cold War, Cuba, embargo, Guantanamo, human rights, Human Rights Watch, President Obama, United States | Permalink.